The Chevy Bolt Concept is truly exciting to me. It's a very bold step from a perceived "conservative" automaker that is taking the next step in electrification. No other automaker besides Tesla has jumped in to announce a 200 mile BEV. Ford and Chrysler had been non-committal, Toyota and Honda are going hydrogen, and the Europeans believe more on PHEVs, though BMW and Audi may have "concepts" for the future. Even the current BEV market leader, Nissan, hasn't announced anything about its next-generation LEAF or if it will incorporate a 200 mile battery. General Motors should be applauded for this--showing a working prototype and putting a stake in the ground with a launch date of 2017. 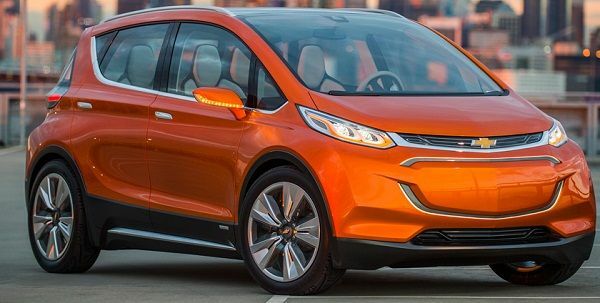 Here see why Chevy Bolt is a great name for this car. The big concern, however is on the current infrastructure. Ideally it would be phenomenal if somehow GM can "borrow" Tesla's Superchargers - even on a subscription basis (say, an extension of Onstar). This would greatly change the perception of both Tesla and GM: Tesla not being exclusive to themselves on Superchargers, and GM willing to collaborate and promote additional usability/utility of the car to the mass public. The Tesla Superchargers are already here, right now, and Chevy Bolt could really hit the ground running on this. It would be a challenge if the Bolt uses the current CCS chargers, however. The CCS infrastructure would have to grow by leaps and bounds compared to where they are at now to ease a "range anxiety" phobic public. Then there are additional challenges on how long it would take CCS to charge a 200 BEV--it's already 39 minutes for a sub 100 mile BEV. I am sure General Motors will engineer a fine battery, battery management system and propulsion system, based on their experience with the Volt and Spark EV. The key is on marketability, and GM has to step up on that. There were many missed opportunities with the Volt 1.0 - a truly great car that could have been even more successful. To see so many in CA - a region that is heavily biased towards imported brands, says something. GM has to continue to show its innovative engineering prowess to the public to change the brand. Rumored 200-mile EV confirmed to be on the way for 2016 – but who will make it? Ivan---Yes GM should be applauded for their announcement concerning their up coming BOLT. They are going up against Tesla in the 200 mile range and $35K market. Tesla will be a "tough nut to crack". Nissan will find itself on the low end of the market unless they up their battery game. Nissan is quiet on the matter as announcing a new longer range at a lower price will nose dive sales today. Being the owner of a Leaf with a 3.3 kw charger and no DCFC port confirms my belief that faster charging is a must. Supercharger access may be cost prohibitive if a second port is needed. However a 100 KW CCS infrastructure would work. I agree Mike. The buzz is growing again, as the Bolt is due in just a few months. No other mainstream manufacturer is launching a 200+ mile EV soon. I could see the Bolt do very well, as its a CUV form factor, which is the hottest segment right now. It is also a versatile design for fleets (especially taxis), as luggage can easily be stowed, and the car seats 5. No surprise that GM had contributed $500 million to Lyft last year.